The most profitable companies are not the most profit-orientated. The most successful cities aren’t the most planned. And the happiest people do not pursue happiness. 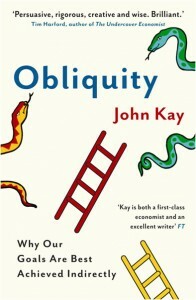 At least so say’s John Kay in his new book Obliquity. He makes a convincing case that our goals are best achieved indirectly. This is contrary to the majority of businesses, economists and policy makers who still favour direct (mechanical and deterministic) strategies – where rationality is prized more highly than good decision making. He argues that the world is too complex and we rarely have enough information at hand about any specific challenge to tackle it directly. When faced by these ‘unknown unknowns’, there are usually more than one answer to any problem and the outcome of what we do depends on why we do it. With regards to innovation, we’ve been saying for some time that it is a by-product rather than an end in itself. Somehow by trying to ‘do innovation’ directly you can quite easily kill it, and certainly if you approach it with the wrong mindset. However this presents us with a challenge. Most companies want innovation but is it really possible to become more innovative obliquely? We believe it is and the answer lies in building a more open business, with a broad and diverse networks of engaged partners. These could be networks of customers or suppliers or partners or anybody with whom you communicate with frequently and may be able to share challenges, data or even resources in a managed way. By becoming more open and by providing a platform for people to participate and interact, then the innovation emerges. But like the unplanned cities, happy people and profitable companies above, innovation isn’t the specific goal. Building an open business is not easy. In fact it runs contrary over a hundred years of business practice which defaults towards a being closed and where economies of scale are largely found internally. The trick is to be engaged and pay attention to what’s going on, and then adapt accordingly and quickly. The last one in the above list is the most interesting for me when it comes to open innovation which we often describe as a self-fulfilling prophecy. The first step is always the hardest, and if you don’t believe it will work, you’ll find 1001 reasons not to do it. But if you acknowledge that engaging with the outside world is necessary, even if it is less predictable, then it will succeed. The answers to almost any challenge are already out there somewhere if a) you know where to look and, more importantly b) if you are willing to be more open. Physicists have been scratching their heads for over a century at the philosophical implications of the wonderfully oblique world of quantum theory. Perhaps it’s time that our business leaders and policy makers abandon their Newtonian world view at last and embrace oblique strategies instead. If they do, then the outcome could be a much greater rate of innovation. To paraphrase John Lennon (when he said “Life is what happen’s whilst you are busy making other plans”) , innovation is what happens whilst you are busy being open. Good point on applying this to Innovation -there is a tendency to see it as something you do in a mechanistic way rather than as a way of approaching things, and John Kay’s insight is a helpful counterpoint to this. However, it’s worth bearing in mind that for many businesses even considering innovation is oblique enough, compared to the day to day of their world – just stepping out of the production and sales cycle for a moment to look at something new is a level of indirection. Thanks for the comment Richard and thanks also for recommending the book in the first place. Much appreciated. Anyway, yes I take your point that even considering innovation is a challenge. I guess our experience shows that many companies lurch from no innovation to full throttle, neither strategy tends to work terribly well. A more embedded and open approach is where the smart organisations are going. Interesting to see how much of the failure rate for companies is down to hidden intention. Any examples that see if the difference factor for Oblique firms is staffs agreement with the approach of the company and general happiness. It would seem to me that open businesses by their nature make it easier for those involved to decide whether or not they agree with direction and strategy. Thus reducing unconscious sabotage. how does the destroy the most important thing bit work? Can see that being tough even for the most committed innovators. Thanks Niall. Great points and yes, I’d love to get some data on failure through hidden but misplaced intention. We certainly have anecdotal evidence but nothing that would constitute proof yet. So yes, openness increases accountability and in some cases (e.g. eBay and Google), using open source code makes it easier to attract and train the right talent and also makes the quality of the code (i.e. the product) better too, so it’s a double whammy. I guess I increasingly think big companies don’t do innovation, they manage it instead.